So, what method of cooking will make the most suitable potato pieces? I need to avoid warping or a rough texture. Is baking better than frying? Any particular oil I should use if I fry them? High heat or lower heat for more time? I'm at a bit of a loss with where to start because everything I know about cooking relates to the eating, rather than use as a building material! 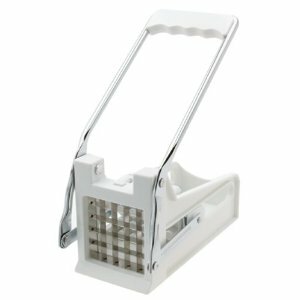 For Potato Jenga you are going to want to use a French Fry slicer like this one from Amazon. The larger slicing grate will produce potato of about the right square size. You will want to exclude the edges and end pieces. Some additional tips: several hours to a day before you are going to serve them slice and blanch the potatoes in sweet water (boil water, add sugar, and potatoes boil for about 5 minutes, remove potatoes to and ice bath and store in the fridge.) Just before frying, dry the potatoes on paper towels to remove surface moisture. Once they are golden brown remove the fries to bowl and toss them with a light coat of olive oil. Might I suggest carrot sticks sliced to the right size? I think you'd be best doing something along the lines of 'confit potatoes'. you cut the potatoes into the desired shapes. If you want something similar to 'Jenga' then I don't think you'll be able to use a mandoline as it won't cut them thick enough, or at least mine won't. Waxy potatoes are a must for this as they'll hold their shape much better. Then immerse the potatoes in a pan of goose or duck fat (plus any other flavourings you want) and bring the temperature of the fat up to a simmer. Cook until the potatoes are tender, the amount of time will depend on the thickness of your 'Jenga pieces', but make sure you are not frying them in the fat, as this will ruin the texture. I'm afraid that however you cook them, your potatoes will be rough or will stick to each other. Perhaps you could play jenga with raw potatoes (cut into appropriate shapes) and have a pot of hot oil standing by to make fries as you draw pieces out. You could thoroughly rinse the cut potatoes to get off extra starch, and then coat them in oil so they don't stick to each other. That way you won't have to worry about roughness or warped shapes due to cooking. Instead of Jenga, why not Blockhead? 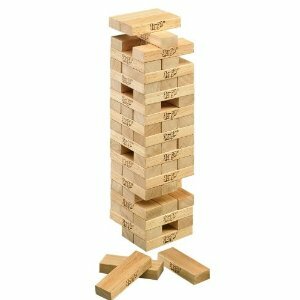 With Jenga, you start with a structured tower of identical pieces, pull out a piece and restack it on top. With Blockhead, you start with irregular pieces, and begin a tower, with each person adding to it (and only the bottom piece can touch the table). In both cases, the person knocking down the tower loses. But with Blockhead, you could use various shapes of potatoes, carrots, and other hard veggies. Google "blockhead game" images for pictures of some of the shapes, although that is not required. You're pretty much talking about potato chips here. 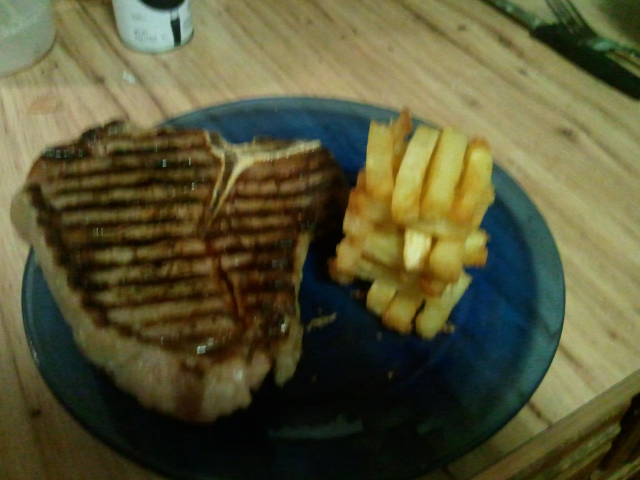 If you want really smooth, "stackable" chips then use a mandoline to prepare them. There is no faster or more reliable way to get perfectly uniform slices of even thickness. Throw out the end pieces, obviously, since they won't be flat. Just get a good coating of oil around the potato slices - you can either use a brush or do it shake-n-bake style as in the above link - and bake it. It's possible to do in the microwave, but you'll have much better control over the crispness with a single layer of chips on a cookie sheet in the oven, especially because it sounds like you don't want yours to be quite as crisp as traditional potato chips. Note: use a silicone mat or parchment paper so that they don't stick. They shouldn't warp much; not for the amount of time you'll be baking them, especially not if you slice them very thinly. If you want something much softer/tastier but still in keeping with the thin/decorative theme then you might try a slightly modified scalloped potatoes recipe - just go easy on the sauce and toppings so that you end up with relatively plain cooked potatoes. If you want to crisp them up, you can always separate the sauce and crisp them chip-style as above. You could even serve the leftover sauce on the side for dipping, or keep it warm for recombining with the potatoes after your "event" is over. Whichever way you go, keep a close eye on them while they're baking, and take them out if they seem done; start checking once you see them turning golden-brown. Not the answer you're looking for? Browse other questions tagged potatoes texture or ask your own question. How can I make a silky smooth, rich mash? How much does a “large” potato weigh? How do you know when a baked potato is done?